Does Your Child Wish You Would Break Up With Your Cell Phone? Geez. Kids these days and their addiction to technology. Their Ipads. Their video games. Their cellphones. Constantly interacting on social media sites like Instagram. Twitter. Snapchat. Tumblr. Vine. As adults, we worry that they’re overly connected. And definitely overly disconnected from the real world in front of them. Then I think about myself. And my relationship with my cell phone. And I wonder if I’m really any different than the youth I’m concerned for. Sometimes I wonder if my children think my cell phone is their fourth sibling. Sometimes I wonder why they never even to think to question me as to why it is always with us. They just expect it. Because they can’t remember a time when it wasn’t there. They don’t question why at times a piece of plastic draws me away from their attention. They just assume it must be something that is part of being an adult. And then they wait until I’m finished responding to a frivolous text, to ask me to push them again on the swing. Before you freak out, I think technology has its place. And I can give you a list of 100 reasons why it has improved my life. I’m also not saying it’s wrong to zone out on your phone at certain times in a day. Or that you’re a bad mom if you aren’t fully focused on your children all day every day. Because I believe moms need an escape. Moms need time to zone out without any shame or guilt. And that’s good for us. But what I’m talking about has nothing to do with that. I’m talking about the way at times the pull to the pseudo world within my phone draws me from the beautiful, real world before my eyes. And how keeping appropriate boundaries with that pseudo world at times proves harder than one might think. It’s weird how the ding of a text no matter how insignificant the text may be makes a person feel needed. And sometimes it IS a real need. But other times, it’s something as insignificant as a weather alert that might draw a person away from a significant conversation like one where your child is opening up about their day. But when you hear that ding of a text, you make them pause to check that you aren’t missing something urgent. Because seeing that weather alert, that doesn’t affect you at all, was *just as important* as hearing about their day. It’s weird how the vibration of a new email can make a person feel like they should check it in case it is the one non-junk email a month that comes to that account but as soon as they check it they find it is Zulily’s latest sale. Something that was absolutely worth reading at that exact moment. Because what mom can live another day without knowing Toms are on sale for the tenth time this year? It’s weird how many times I walk in rooms of adults sitting across from one another that all have their cell phones out scrolling through who knows what while real people sit in front of them. So then I too pull out my phone and join in the robotic ritual because, “Hey, why not look at another awesomely unattainable idea on Pinterest that will make me feel more inadequate as a mom?” instead of talking with the moms sitting in front of me that don’t have time for making homemade probiotics either. It’s weird how unsettled I feel about it at times. Because I know technology isn’t going anywhere. And honestly, I wouldn’t want it to. But I DO think it is important for me, for all moms, to feel good about our relationship with technology. And to make sure we all take time to find the right balance. For ourselves. And for our children. I just know that I want to be more engaged with the real people sitting in front of me than the virtual ones in my phone. And I want to remember that my phone doesn’t always need to be with me. And that I can actually survive a trip to the park without it. Even, dare I say it, if that means missing a few adorable shots of the kids. Last fall my baby left my Iphone in the toilet overnight. As a result, I went 17 days without it. At first I went into full blown shock mixed with slight depression, then about five days in, I found that the more I disengaged from the virtual world, the easier it was to engage with my children in front of me (while they still care about talking to me, not texting me). You see. I don’t think any mom 20 years down the road will look back on her time with her kids and say I’m sad I didn’t respond to all of my Facebook notifications. Or texts. Or emails. But I can think of many children that will remember that she didn’t. And maybe, just maybe, those same children will be better at putting down their phones as a result. Especially when it’s their mom standing in front of them dying to have a real conversation with them. If you enjoyed this, subscribe to read more. And if you think someone else could benefit from reading this, please hit share. The author of this article is a wife, mother, blogger and licensed marriage and family therapist. 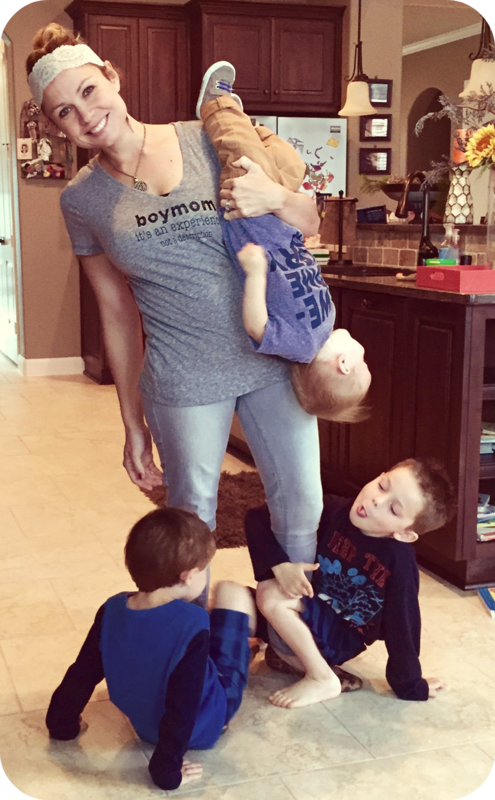 99% of her time is spent keeping her 3 boys alive and the other 1% is spent writing about their crazy times in her blog Sanctification and Spitup, which is also found on Facebook. Over 20 years ago my daughter would throw a fit if I ever answered my cellphone while she was with me. To this day she does the same. It used to frustrate me. I now watch her keep her very smart and very popular phone put away when she is with another human being. She is brilliant and loving. She makes eye contact and is fully present with whoever happens to be fortunate enough to be with her. This is one of the many lessons Ariana has taught me. I love how children teach us!